It is time to get Frozen at Epcot! Both Frozen Ever After and the Royal Sommerhaus are slated to debut on June 21! These two attractions, both located in the Norway Pavilion will give Guests a chance to experience the Frozen story in a whole new way. With the Frozen Ever After attraction, the timeline for the ride, which replaced Maelstrom, will occur after the film takes place. 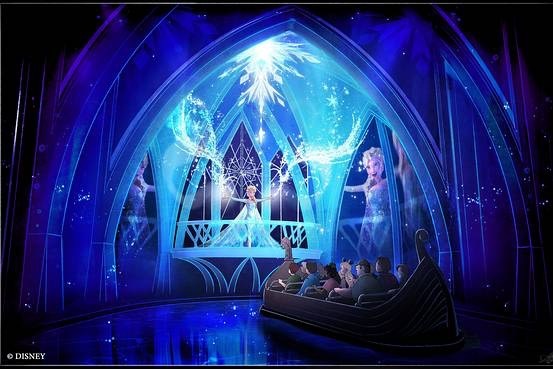 It will take guests on a boat tour through Arendelle during a “Winter in Summer” celebration where Queen Elsa who has embraced will create a winter-in-summer day. During the adventure Queen Elsa, Princess Anna, Kristoff, Olaf, trolls and Marshmallow join Guests on their boat journey through the frozen willow forest, past Troll Valley and up to the North Mountain to Elsa’s ice palace, returning to the Bay of Arendelle. For those looking to make FastPass+ reservations, you will be able to do so beginning on May 21. Over at the Royal Sommerhaus, guests can meet both Anna and Elsa in their new greeting location. 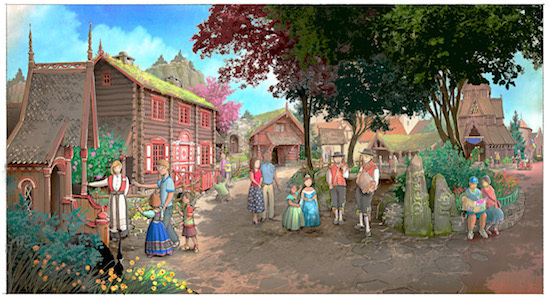 The story behind the Royal Sommerhus is that the location is Anna and Elsa’s summer home that was opened for visitors and was inspired by a Norwegian countryside cabin. Royal Sommerhaus will not be offering FastPass+. As a reminder, with the addition of the Royal Sommerhaus at Epcot, Anna and Elsa will be leaving the Princess Fairytale Hall at the Magic Kingdom. Other characters will be slated to take their place in the Fantasyland meet and greet location. For Guests looking to see Anna and Elsa in the Magic Kingdom, you’ll be able to catch them in both the Festival of Fantasy Parade and the upcoming new Cinderella Castle stage show, Mickey’s Royal Friendship Faire. With the addition of both the Royal Sommerhaus and Frozen Ever After, the Norway Pavilion will now open at 9:00 a.m. daily. Can’t wait to crash the system 7am tomorrow!!! Is the Frozen show at Hollywood Studios sticking around? It was hilarious. Yes it is. It plays at the Hyperion Theater. Do we know how this fits into the tier system at Epcot? Any idea on if these are tier 1 or 2 fastpass attractions? If both this and Soarin are tier 1, going to be a madhouse to run to one or the other in the morning! No idea yet, but as soon as I find out, I will let you all know! Edit: I have found out that Royal Sommerhaus will not be offering FastPass+, so knowing that, I would suspect that Frozen Ever After will be a Tier 1 attraction. I know they have changed the 60/30 day availability time to 7 AM, but what if you have FP’s already and simply want to change to Frozen? Will it open at 12AM tomorrow or not until 7AM? Tried to get an answer from WDW Help Desk, but they didn’t know. Wow. No fastpass?!? That’s crazy. What time can we start making fast passes reservations tomorrow, 6 or 7am? I need to set my alarm! Can we expect a soft open? We are leaving June 16. I’m hoping the same thing, although I’ll be there Memorial Day weekend. Will Frozen Ever After open at 11:00, with the rest of World Showcase, or will it open at 9:00 (hopefully) to alleviate lines? I think it has to be a tier 1; I just hope they throw guests a bone and make Test Track a tier 2. Otherwise, there is really only 1 fastpass at a time in Epcot. The tier 2s now are pretty much worthless. In a shocking turn of events, the system crashed at exactly 7am this morning. No Fastpasses available for Frozen Ever After. Keep trying they finally became available a little while ago. Yes, I eventually got one 40 minutes and 482 curse words later. Thanks! Amazing news, but anyone else having trouble accessing any part of MDE?